Tango's menu offers contemporary American Cuisine in a comfortable setting, located just off the train tracks in Bryn Mawr. You can settle in to our Main Dining Room in a cozy banquette, enjoy dining by the fireplace or perhaps the intimacy of a smaller room with bright French doors. Our Train Room is reminiscent of a dining car as the train whizzes by the window. In the summer, enjoy Tango's deck seating. A large wrap-around patio comfortably seats guests under a shaded canopy or along our fabulous Cantina Bar. Voted "2008 Best Al Fresco Dining on the Main Line" by Main Line Today. Our menu features the comfortable dishes you always love and we feature seasonal specialties with some cultural flare. Tango offers an extensive beverage menu and wine list to compliment your meal. We carried four children under 12 and four adults for an early dinner. Staff was very attentive to all. Brought kids' meals before adults, which helped a lot. menu was varied and had something for all. plus it was in the neighborhood. The service was very very slow. The food took for ever to come out and was cold. When I told the server she did not even offer to bring it back to the kitchen. I asked for a manager. When I spoke him he he really didn’t care. 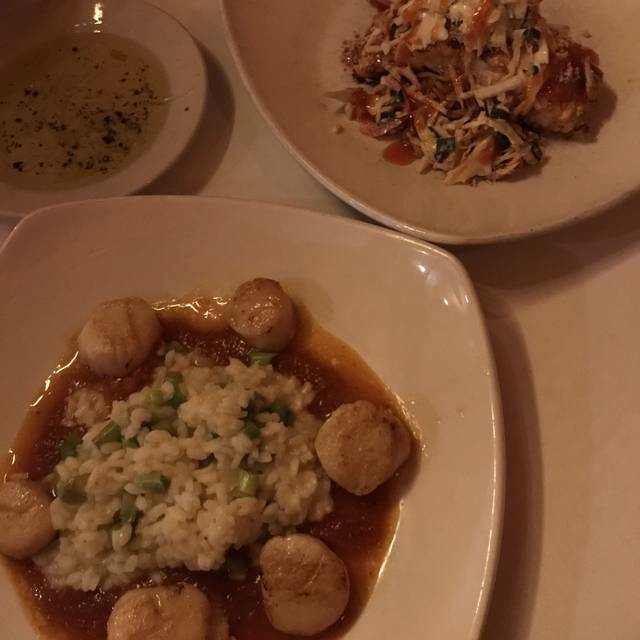 A good meal overall, and my wife was disappointed in the sauce on the spinach and artichoke hearts in her scallops selection. The scallops were wonderful, and the vinegar in the sauce on the veggies was overdone. Excellent meal--satisfyingly cheesy onion soup, melt-in-your-mouth Salmon, apple tart with ice cream..
Nice menu. Good service. Good food priced appropriately. Could hear each other talk. We were not seated in the small room we had requested because it had been reserved previously. But the hostess gave us a special table in the back. We were not rushed and the server was very accommodating as we waited for late comers and again at the end of the meal. She handled the birthday cake for us and it was beautifully served. Great meal. Able to talk without feeling like I had to yell. Great service. Always a great experience here. Superior as always. I have eaten here several hundred times since it opened. Excellent menu items diverse enough to satisfy most tastes, always prepared consistently to high standards using highest quality ingredients at reasonable prices. Best cream of mushroom, black bean soups, gazpacho, vichysoisse and New England Clam Chowder. Excellent friendly service and very attractive & comfortable ambience. Tango is a great spot for lunch or dinner in Bryn Mawr, PA. I like sitting in a booth and watching the trains wiz by, very fun. Food is also very good. I stick to basic fare. It's also convenient for my friends and colleagues from Philly because they hop on the train for the short ride to join me in the suburbs. Parking is also convenient and with no charge to do so. I had the Caesar salad with grilled chicken for lunch which I had to to saw in pieces with the dull butter knife. The salad on a whole was just okay... nothing specisl or tasty. I also ordered coffee, which tasted like it was on the burner for hours. Overpriced for the quality and portions served. The service was pretty good and the ambience too. I would not recommend and would not return. Choose this restaurant based on the many options and good reviews. Tango has been a favorite place for my family and most specifically my mother, for many years. Many happy family events celebrated there. We arrived around 4:15 pm for a 6:00 pm to enjoy "happy hour" at the bar, as the friends we were meeting did not drink. Unfortunately, when we ordered our cocktails, Mike (the bartender) said he didn't have the ingredients behind the bar .. then just stood there. Assuming he wanted us to select something else, we went down the list until there was a drink he could make. Did not leave a good impression -- fortunately, once our friends arrived and we were seated, the meal was "to die for." You just need to better stock the bar. As always, a delightful experience. Will continue to recommend Tango Bistro to friends, clients, and family to enjoy great food, service, atmosphere, and, most of all, a welcoming person at the front desk. Always feel comfortable while dining at Tango, knowing all my food needs will be handled professionally, and with kindness. Thank you! was very disappointed in my dinner at Tango. Too much dressing on salad and shrimp were tough. Mushroom soup was as good as ever as was Key lime pie. As always, a delicious meal, nicely prepared with great service. Thank you again as always for your consistent service and food. Our server was friendly and accommodating to our every need. My birthday meal was delicious and exactly what I requested. The food was wonderful, as always!! It was a wonderful lunch for three old friends to catch-up! Tango has gone back to their previous menu, which I like a whole lot more than the last iteration they tried. Their food is great, and the atmosphere can't be beat. My husband and I really like their individual drink shakers, that they leave with you, so you can get every last drop of liquid out of the shaker. It's wonderful place to come and relax, and the price is right - although their food is really good, they don't have the overinflated prices of many so-called 'high-end' restaurants, and yet Tango is equally as good as many of them. Keep up what you're doing. Tango is a neighborhood treasure. It is a warm, friendly place to dine with special people. All was good; lobster ravioli and trout were good choices. The tuna appetizer was excellent. Bourbon cocktail was pleasant and tasty. It’s really between a 3 and 4 star experience. I always enjoy the ambiance at Tango and our waiter Nick was fun, funny, and very helpful. The bread is always a treat, the ahi tuna is great. The fried oyster appetizer was great. The bouillabaisse was in a kind of brown sauce that we didn’t think was so great though. And the cost seemed a bit high for the meal. Always a very, very good meal. One of our favorite restaurants since we moved to the area 18 years ago. The service is excellent, and the food is always delicious. Family get together. Good menu and drink selection. Wait staff was very considerate. All in all a very pleasant evening. Restaurant smelled of bleach/ cleaner upon entering. Waiter dropped silverware into glass of water and wasn’t very apologetic, accidents happen but you must apologize. Cauliflower steak was good, but drenched in oil..
Had the scallops with spinach. Scallops were cooked nicely but lemon in sauce was a bit overpowering. Bread served was subpar - too hard. Minor annoyances but meal was good enough for me to return. Love their menu choices at lunch only go at lunch. The restaurant is a bit too dark for my personal taste, but the food was good and the service was good. I didn't appreciate the "up-sale" on my glass of wine, but that was my fault for being distracted by my children. Very busy 2/16 after Valentine’s Day. It was a 45 minute wait even with an open table reservation. Food was great, but more staff was needed that night. I think the food is good but a little too pricey. The atmosphere is ok. I was not blown away and the amount paid for two couples for just getting entrees, 1 alcoholic beverage and a coffee was way too much! Seating between tables is a little tight. We were shushed. BY the old ladies next to us. An old friend and I met for lunch. Service, food, and ambiance very good.